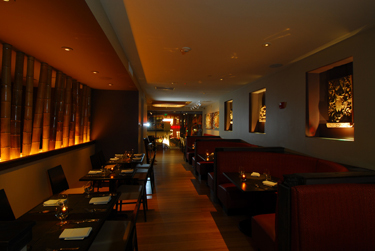 Named one of the top 25 Best New Restaurants in America by Esquire Magazine, OM Restaurant & Lounge is a dining and nightlife destination in Cambridge's Harvard Square. OM Restaurant & Lounge offers an approachable menu featuring globally-influenced modern American cuisine, drawing foodies and neighborhood patrons alike. With imported dramatic Tibetan and Nepalese treasures, OM Restaurant & Lounge maintains just the right balance of authentic Buddhist art and chic design. The upstairs dining room promises a journey through the Far East while the mod downstairs lounge and bar boasts sleek leather sofas, a hypnotic water wall and of course, OM Restaurant & Lounge's signature aromatherapy cocktails. Custom design your next special event with us. OM Restaurant & Lounge features lunch and lounge dining 'til midnight.